To celebrate the 50th anniversary of the Porsche 356 Speedster, one of the most iconic models in sportscar history, Steve Heinrichs decided to organise an event that could not be equalled. Steve Heinrichs, a vivid Porsche aficionado and at the time owner of the most important Porsche 356 Speedster collection, managed to gather hundreds of Porsche 356 Speedsters on a single place. 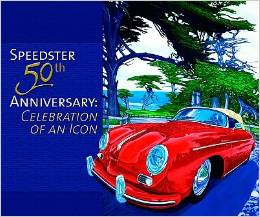 Next to the Speedsters, over a thousand other Porsche 356 showed up in the Monterey Region. This book is the official picture book, published after the event to give the visitors the opportunity to relive the spirt they enjoyed at the event. And those that didn’t manage to visit the event now have the opportunity to see what they missed. Stunning, that’s the only word I have for this book.